The third book in Al-Manhal’s set of stories for children learning Arabic is called يحيا العدل yaḥyaa l-ʕadl ‘long live fairness!’. This is a fairly simple book. 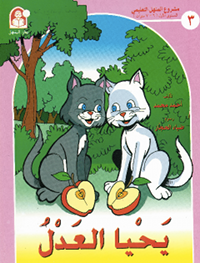 Since the main characters in it are a pair of cats, you will encounter a number of dual forms, such as القطّتان ’al-qiṭṭataan ‘the two cats’, which is the (nominative) dual form of القطّة ’al-qiṭṭa ‘the cat’. You can download a PDF of the book from here. Within certain PDF viewers (but not all PDF viewers!) you can listen to embedded audio by clicking on the text.